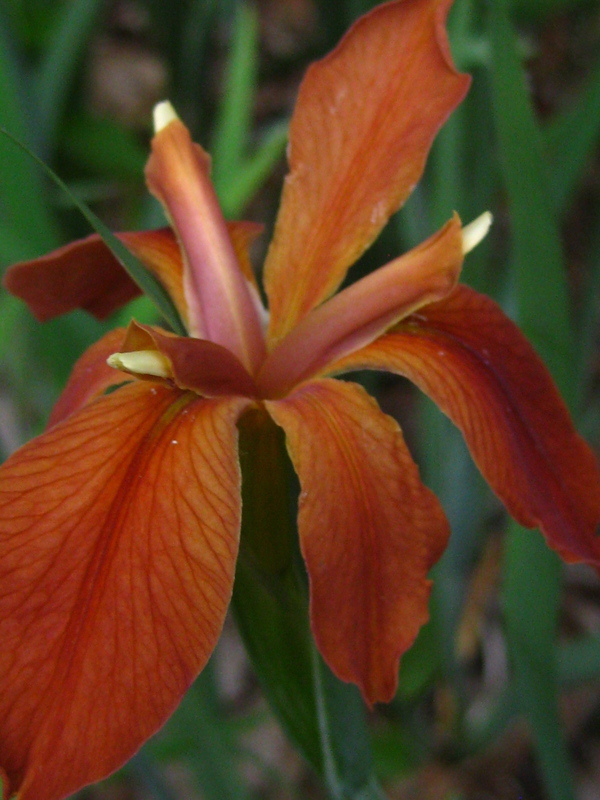 Copper iris, Iris fulva, is a litte-mentioned hummingbird plant that has grown on me over the years. It is native to wetland habitats in the South Central United States, as far north as Southern Illinois. This iris has been the subject of many scientific studies examining the nature of hybridization in the wild with closely related species. It is a member of a group of iris native to the Southern U.S. collectively known as Louisiana Irises. This group has provided the raw material from which many horticultural varieties have been derived. Field studies have revealed that Iris fulva is pollinated in the wild by hummingbirds–these studies are what prompted me to give it a try in my garden in Minnesota. One may assume that any species native to the Lower Mississippi River region would not survive zone 4 winters here in Minnesota. I had read reports of it surviving in zone 5, so I went ahead and purchased some mail order plants, planted them in my beds, and crossed my fingers. I’ve been delighted that they’ve sailed through some tough winters here, without any winter damage. In fact, they are doing so well that they have spread nicely into a sizable patch where they were initially planted. This, despite that fact they they would probably like more sun and more water than they get where they’ve been planted. If it has a fault, it is probably that it has a short bloom season–just a few weeks, usually in the first part of June. This year they were early, reaching full bloom in late May. I like that they bloom at a time of year when relatively little natural nectar is available in my garden. Every year I’ve seen at least a few visits by hummers, which thrills me. This year for the first time during peak bloom, I had a hummingbird defending the patch from other hummers. It seems like every time I looked at the patch, that hummer was either visiting one copper-colored flower after another, or was chasing away a would-be thief from his patch. Now that they’ve spread I think I’ll dig some up to start a new patch in a sunnier, lower and wetter spot in the garden to see if they’ll do even better in conditions that more closely mimic their native wetland habitat.